Once known as the Patton Memorial House, the family residence of W. W. Patton, his wife, Harriet, and daughter, Emma, was built in 1902. Among many community positions, Patton served as Kent’s postmaster and superintendent of Kent Schools (1872-1878). After Emma’s death in 1939 the house was bequeathed to the Coterie, a ladies organization founded in 1896. This “circle of friends,” which formed from the merger of a literary club and a cooking club, was chosen to maintain the property and provide space for community groups to gather. Women of prominent Kent families who were active members of Coterie in its early years include Mrs. Harry Longcoy, Mrs. Edward Parsons, Mrs. Duncan Wolcott, Mrs. W.S. Kent, Mrs. Frank Elgin, Mrs. Roy Smith and Mrs. Burt Spelman. 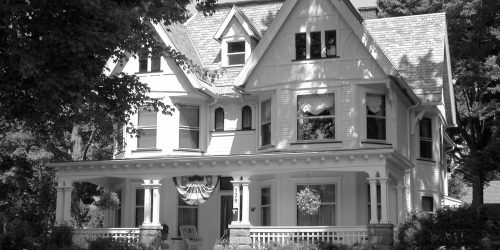 The home continues in the care of the 125 members of the five Kent Coteries who strive to maintain this historic dwelling, which stand, regally, at the west entrance to downtown Kent. The Charles H. Kent home was built in 1843 in the West Main Street district and is now located at 125 N. Pearl St. It is an example of Gothic revival.